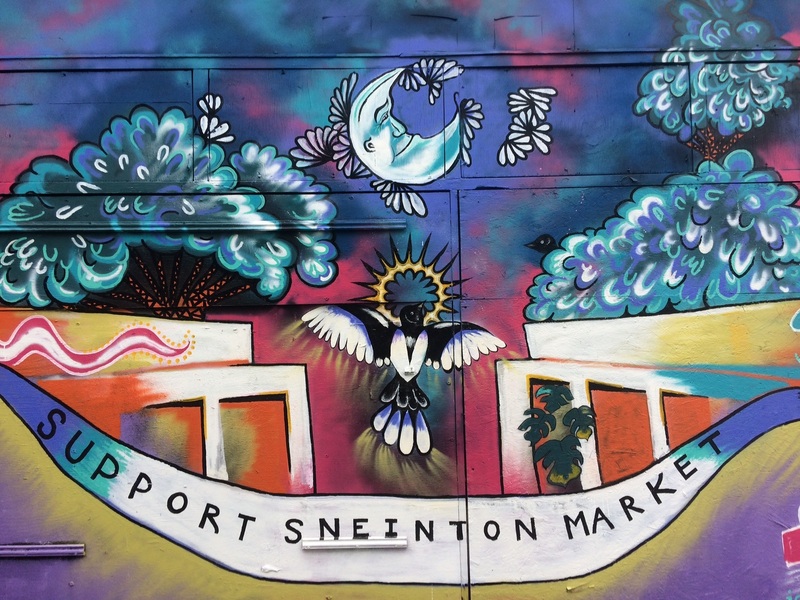 Sneinton Market is hosting the Vegan Market on the 1st and 3rd Saturdays of the month. I am neither a Vegan or a Vegetarian but I am always interested to check out the local vendors to see what they have going on, and I always like to find new food places. I have been checking out the market over the last couple of months and I am happy to see that it seems to be flourishing and that they have a good range of vendors and suppliers to try out. This last weekend I checked out a few more of the people at the Market including Jack and The Bean from Derby, CocoCheesecakes (also from Derby), and Vegan Love from Leicester. I had one of their Steamed Bao Bun filled or perhaps topped with Hoisin Jackfruit, Cucumber, Crispy Shallots, nutty crumbled bits and Coriander for £6. There was a lot of interesting flavours mixed into this bite of food. It looked healthy and did actually taste pretty healthy too, lots of crunchy salad leaves, chopped up cucumber, spring onion, and coriander, basically if it was Green it was there to be seen. It was a bit of a messy snack, but that was fine as it all tasted pretty good, the bun was a bit soft and fell apart a bit under the weight of all the filling. Handily I had a fork which I used to scoop up all the detritus from the tray so all was good. I picked up a couple of the mini cheesecakes from Cococheesecakes just because they looked so goddam good. I mean forget the fact that they are on theme and were Vegan, these can sell themselves on their beauty alone. They were £4 each and they had an offer of two for £7 which was basically just shouting out to me that I had to have two to try instead of just one, what a shame 🙂 It was also pretty lucky as I wanted to try more than one anyway, I picked out the Millionaire which I was hoping was basically going to be just like Millionaires Shortcake in Cheesecake form, and the Peanut Butter and Salted Caramel one, just because that off white creamy topping was so tempting. I ate both of these later over the weekend with various cups of tea and they were both most enjoyable. I think I liked that Peanut Butter and Salted Caramel one best, the topping had a nice cream like texture, just like a cheesecake would and the peanut butter flavouring was quite gentle. It had all the taste of peanut butter with the added bonus of not having goo stuck all over you mouth. This one also had the better of the baked biscuit bases, it was pretty solid and had nice crunch to the bite. The Millionaire cococheesecake did look attractive and it was a bit sweeter than I was expecting. I liked it but I prefer a more solid bite in my cake, this was a bit more like a Chocolate Mousse. The biscuit bake was not quite as good on this particular one, it was a bit more crumbly. Mind you that could all be because I ate this one last and much later in the day so it might have got a bit warm, perhaps I should have kept it in the fridge? I would most certainly buy some more of these cakes from Cococheesecakes if I see them again at the Market. Vegan Love were here selling their Vegan Pies and even though I had already eaten I was thinking it might be a good plan to get one to take away for tea later in the week. I kind of pondered over their Meat substitute offerings as they have a ‘Shepherd-less’ pie, an ‘All-Day Breakfast’ pie and a ‘Vish’ Pie. All of which are I expect a bit self explanatory. I nearly got all of them as I fancied all three. In the end though I picked out the pie called “The Vegan Love” which was ‘Spiced Seasonal Vegetables in a creamy ‘cheese’ sauce, topped with buttery mashed potato/sweet potatoes’. I was thinking that maybe Ishould see if they could do a decent veg pie before I went out on one to try the faux meat efforts? It was as promised a little bit spicy, and also surprisingly peppery, it was hard to pick out the veg inside but it seemed to be mostly broccoli, carrot, perhaps a bit of cauliflower mixed in with the mashed potato and sweet potato. It was pretty ‘creamy’ as well. It was a pretty tasty little effort and was very homely but in hindsight I think that I probably should have just tried one of the other ones like the pretend Fish ‘Vish’ Pie. Maybe next time? Also, can confirm that the Vish Pie from Veg’an’ Love is delicious, definitely try that one next time!